Articles and Reviews > Waynes Hard News > WAYNE’S HARD NEWS - How to spot a fake DVD. WAYNE’S HARD NEWS - How to spot a fake DVD. DVDs are also a means by which some bodybuilders give back to the sport and their fans. DVDs sales alone never made a bodybuilder rich. When you buy the genuine article you are supporting bodybuilding in general, not ripping it off like a scumbag. Every mass produced brand new DVD I have bought has come shrink wrapped; not one came in a bag, sleeve or CD case, and not one of the production companies I contacted said they supply a brand new DVD to distributors at wholesale in anything but shrink wrapping. The sleeve should be printed with high quality ink, no blurring, and no running. The text should be clear and crisp and easy to read. In fact it should look exactly like a Hollywood blockbuster DVD sleeve: perfect in every way. Similarly the paper should be reasonably thin and of good quality, while many fakes are on photo paper which is much thicker. Legit Bodybuilding DVDs are printed professionally using professional grade glossy or semi-gloss paper. Genuine MOC Jay Cutler DVD on the left – Fake on the right. The lower standard of print on the fake is clearly visible, especially the over saturation of the skin tones. Also notice the strong colour of the MOC Video gold logo – a common pirate mistake. I really cannot stress how important these two things are in spotting a fake DVD. Bodybuilding is a small sport, with some DVDs having very small productions runs, however, every company contacted said their brand new DVDs come with a quality colour cover professionally printed, and a crisp face label printed on the DVD disc. Most IFBB show DVDs come packaged this way too, only smaller shows where the production number is a hundred or less may not be like this. Do not be fobbed off, when you are buying professional products, they should always be presented in a totally professional way. Look at the brand of the case, if it says “Maray” just below the disc holder I would immediately contact the producer of the DVD to check. I checked 34 of my own DVDs and not one was marked in the same way as the fake DVDs. Also, latest DVDs such as GMV's “Jay Cutler – The Ultimate Beef”, and the latest Mr. Olympia DVDs do not come in standard thickness cases. They are in the new slim-line cases. If in doubt check with the original producer/supplier. Just like the sleeve, printing should be clean and crisp, not blurry or muted, and again professionally printed DVDs are never tacky to the touch. Your finger should slide easily across the printed side, if it does not, then it is almost certainly not legit. 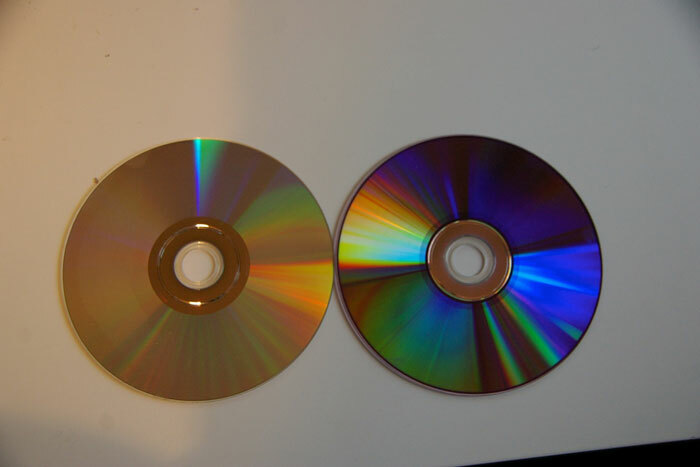 The difference between the fake disc on the left and the real disc on the right is even more apparent, with the blurred poor quality print clearly visible – and often the print on the fake disc is also too thick and slightly tacky. Next turn the disc over, if the disk surface is silver like a mirror, then the disc was pressed, and if it is blue/purple then it has been burned. In my collection burned discs are either low production run items such as contests or features on lesser known stars, or from smaller names in the industry. For example GMV Productions is Australia has a huge back list of over 1000 DVDs they offer, going back to the first ever VHS videotape they offered. Obviously these 1000 DVDs cannot all be pressed where the normal minimum duplicating run is 1000 copies! Re MOC Video - every one that I have is pressed, and GMV – some of their own productions are pressed, and so on. Smaller runs, from small companies will probably have been burned. In my experience fake DVDs do not come in professional cases, with professionally printed sleeves and discs. As with any suspicions - contact the manufacturer directly, or the producer directly – as they are all very helpful and usually have their email or site details on the rear cover of the DVD. The mass produced pressed disc is on the left, while the burned one is on the right – with a clearly discernible blue colour. As an example, a Jay Cutler DVD or a current year Olympia DVD is always pressed. Obviously do not become too hung up over pressed DVDs because a large run of pressed DVDs such as Olympias do sell out. What then normally happens with these and similar pressed DVDs is that small quantities are then made by the producer as burned copies, as the demand will be small some time after the initial run has sold out. Always be aware of who you are buying your DVDs from and stick with reputable suppliers. When you look at the disc, look at the middle for maker identification, some fakers are still dumb enough to use ones with CD-R or such like printed there but this is increasingly rare. If it seems like you are getting a bargain price that is too good to be true - then it really is too good to be true - and not the genuine article! Once again, if you have any suspicions contact the manufacturer direct. Personally I would ask for a photograph emailed as a jpeg of the actual product for sale, inside and out - not just a stock photo from the producer. If the seller is listing “used copies”, and has sold multiple copies of the same DVD - walk away from this guy as fast as you can. Report him to the genuine copyright holder! It is worth checking whether the DVD offered is on general release in your country by looking at the bigger distributors. In the UK you would look to outlets such as the bodybuilding DVD store, Weider, Amazon. If it is not stocked at any of these outlets – ask the seller why they have it. They should have a reasonable explanation. When writing this article I contacted an EBay seller about their Kai Greene Vol. 2 DVD. The main distribution channels were still the producer, Kai’s sponsor in the USA and GMV. The seller said it was an “overstock”, sorry, but you do not have an overstock issue on a popular brand new release DVD that is not widely available. The seller was obviously not telling the truth. There isn’t a hard and fast rule, but you need to be thinking about what is going on. Some older productions may not even be officially available as a DVD, such as Pumping Iron 2 – The Women by George Butler. If you have any suspicions – check with the production company or ask a reliable source. To be honest, I have given up almost entirely on EBay DVDs unless the seller is a store I know about and trust. Massive Direct is Weider UK, and the prices reflect that. Many big retailers use EBay to supplement their core business. A quick 5 mins search with Google Maps or Google Earth can verify addresses, and even a quick phone call is worth it to avoid a fake. It saddens me but the only fakes I have bought have come from eBay - and all of them from sellers with perfect feedback on their DVDs. Clearly most people do not know a fake when they see one! Hopefully with this guide and the pictures attached, you will be able flag the faker straight away. Dispute it - I have always got my money back, without returning the DVD to be sold again. By going to a dispute with a solid list of the differences between the real deal and the fake you will win. If you are sold a fake, I also urge you to report it to FACT. Bodybuilding is a small sport, and if you do not support it then you will not see major events and new DVD productions in the future. I may seem down on EBay but at the moment it is littered with fakes. At the same time companies such as GMV are supporting the sport by buying up old and “going out of production” stock, meaning that we the fans can still get hard to find DVDs. I hope this guide is useful, and I hope it persuades the fakers to go leech off some other sport or maybe even stop being scumbags completely. Piracy is a crime – it is theft, and they are ripping off small companies and the bodybuilders themselves. It is not like they are taking a few dollars from multi-million dollar corporations. I would like to especially thank Wayne Gallasch at GMV for his huge amount of help in preparing this article, as well as MOC, and Mike Pulcinella for their input. Here is a comparison of the fake Jay to the Z Sleeve – with other genuine Jay Cutler DVDs. Look especially at the excessive colour saturation, and the poor print on the Jay to the Z text “The beginning and the end” which is very blurry. You can see the yellow logo is not the correct MOC yellow too. *NOTE. All MOC Jay Cutler DVDs, Kai Greene and Olympia DVDs are available at GMV.